This coming February, the successor to the George Zimmerman trial will start in Melbourne, Florida. Michael David Dunn will be on trial for the alleged murder of 17-year-old Jordan Davis. Dunn fired 10 shots from a 9mm pistol into a car containing four black teenagers, who he had confronted for playing loud rap music. Dunn claims that Davis said, “You’re dead” and reached down for something. Dunn quickly reached into his car’s glove department, pulled out his pistol and shot, killing Davis. Dunn has invoked a stand-your-ground defense, although no gun was found in the car. Due to the absence of return gunfire, Dunn was unharmed; Davis, in the back seat, had no means of egress due to child safety locks on the doors. After the failure of the Florida courts to convict George Zimmerman for the killing of Trayvon Martin—without Zimmerman having formally invoked a stand-your-ground defense, but with SYG as the backdrop for the incident—a number of nonprofits and foundations took aim at those states with stand-your-ground laws and at the American Legislative Exchange Council, which had been effective in promoting the concept among state legislatures. ALEC’s fortunes took a tumble in 2013.Their corporate sponsors bolted, though that’s due in part to other elements of ALEC’s agenda, such as its promotion of restrictive voter identification laws. To recover its standing and focus, ALEC abandoned its longstanding advocacy of stand-your-ground statutes. But has the tide turned against stand-your-ground laws? Florida is hardly the only state where stand-your-ground defenses are being invoked. In Georgia, for example, a 34-year-old homeowner named Joe Hendrix shot and killed 72-year-old Ronald Westbrook, an Alzheimer’s patient, for having wandered onto Hendrix’s porch in the middle of the night and jiggling his front door knob. Rather than immediately pressing charges against Hendrix, the local sheriff’s department instead debated whether the state’s stand-your-ground law protected the homeowner from having to retreat in the face of perceived danger. 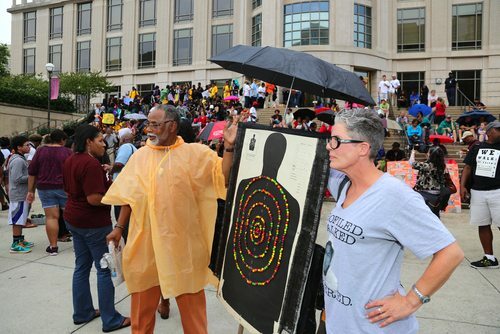 Stand-your-ground has been invoked in cases in Michigan, South Carolina, and Kansas and Missouri, among others. Florida’s was the first stand-your-ground law in 2005, followed by 25 additional states. A few other states have laws that, unlike the stand-your-ground “shoot first” laws, allow for the use of deadly force in self-defense in public with no duty to retreat, a minor legal difference, but accomplishing much the same outcome. Despite flurries of bills introduced in state legislatures to modify stand-your-ground laws, it does not appear that any states have succeeded in eliminating them. In 2013, a bill to limit stand-your-ground laws failed in the Mississippi state legislature. In the U.S. Congress, Representative Sheila Jackson Lee (D-TX) introduced HR2812, the “Justice Exists for All of Us Act,” which would have prohibited states from having stand-your-ground laws except for use in cases by victims of domestic violence, but the bill never emerged from committee. However, bills to enact stand-your-ground laws in Ohio, New Jersey, and Washington state were introduced and are still pending as of this writing, with Ohio’s already passed by its lower house. None of the efforts to reduce or repeal stand-your-ground laws seem to have advanced in state legislatures, even with amendments as limited as preventing the invocation of stand-your-ground defenses for people like Zimmerman who chose to pursue their victims. That isn’t for lack of nonprofit attention to the issue. This past year, the National Urban League and Mayors Against Illegal Guns issued a report showing that in stand-your-ground states, not only have homicides increased, justifiable homicides increased by 53 percent—and 200 percent in Florida. The report concluded, “There is significant evidence that Stand Your Ground laws undermine public safety and increase overall homicide rates,” but state legislatures haven’t been convinced. While the campaign against ALEC has been very successful in scaring off ALEC’s corporate and foundation funders, including among the latter the Bill & Melinda Gates Foundation, the campaign to reverse the tide of stand-your-ground laws has yet to make a major mark. Some foundation leaders expressed their dismay at the Zimmerman verdict. For example, the California Endowment’s Robert Ross expressed how his “anger and frustration [in reaction to the verdict]…evolve(d) into a sense of strategic resolve.” The California Endowment and others, such as the Robert Wood Johnson Foundation, the Open Societies Foundation, and Bloomberg Philanthropies, have announced initiatives focusing on black men and boys aimed at problems such as “disproportionate rates of poor health, inadequate education, high unemployment, and incarceration” affecting young black men, but not really addressing the prevalence or expansion of stand-your-ground state statutes. The lack of movement on this issue may reflect the nation’s lack of progress on gun control in general, despite the public outcry that followed the Sandy Hook murders in 2013.